If your community is struggling, it’s probably not because of the lack of support or bad technology. It’s more likely you’re not taking a community-led approach. Community building isn’t new. It’s been around for centuries as a discipline and longer as a concept. What is new is taking the traditional community approach to build successful communities internally as well as externally. We’ve studied several hundred internal communities. Many are struggling. They take an approach which is diametrically opposite how communities develop. Here are five insights you can immediately apply to build better communities. Too often responsibility for an internal community is given to the wrong person (if anybody). Every community, internal or external, needs a credible founder. This founder needs to be connected and respected. If you’re just starting out, go through the CHIP process. Cultivate content, host events, interview top experts, and participate in existing groups to grow your audience and your credibility. You have to be the person others listen to. 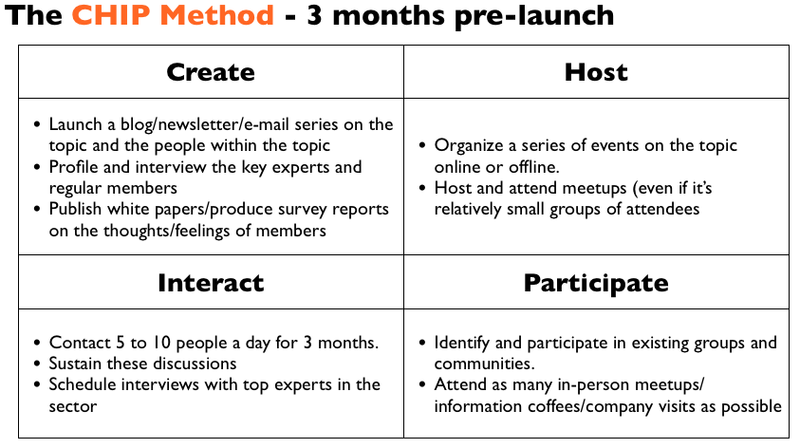 Top-down initiatives to launch a massive community overnight always fail. Successful communities start small and grow big. That means beginning with a few colleagues the founder has the closest relationships with and growing steadily from there through their friends. Don’t have a big meeting to announce the launch of a community. Let it bubble up from the bottom. Let other groups in the organization hear about and request it. Gradually add more groups as you need them. You might even want to keep the community exclusive initially. People love to join exclusive groups. Here’s a simple rule of thumb, aim to recruit 1 new member a day. Reach out to 1 person to day with a personal request to join. People join and participate in communities to solve problems they know they have, seize opportunities they need to exist, or increase their social standing. Your entire concept should be based around one of these. That means interviewing your members beforehand and identifying their hopes and fears (problems and opportunities) then building all the discussions, content, and activity around this concept. Don’t make the community about the organization, have a laser-focused concept. You can always expand later once you’ve achieved critical mass. Most people that join don’t participate; most people that participate once never participate again. A newcomer is a precious, valuable, thing. Don’t assume they will naturally find something they want to do. Ask them about their biggest challenge (or what they hope to get from the community) and find a place they can ask for help (or introduce them to someone who can help). Make a big deal over your newcomers. You have a short window to convert them into active members. Make sure they engage in an activity on the day they join. You need to begin with small goals the group can achieve in the short term. This might include tackling a single common problem, documenting the solution, publishing a small ebook, and documenting the history of the group’s successes. I like having a page that lists all the successes of the group. This builds a powerful sense of group identity. //Richard Millington is the Founder of FeverBee, a community consultancy. You can see Richard speak at Interaction Intranet Conference this September 17th in London. Get your ticket here. To access a free mini-course from FeverBee, click here.